A mesh pad with P80 grit used for buffing and polishing wooden floors after sanding in order to remove sanding marks and prepare for sealing. 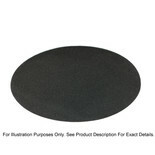 A mesh pad with P120 grit used for buffing and polishing wooden floors after sanding in order to remove sanding marks and prepare for sealing. From National Abrasives. An aggressive stripping pad, particularly suitable for fast floor stripping from varnish to bare wood.